Ok, these are just too cute. 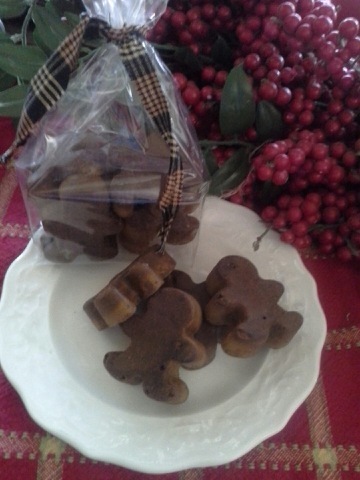 Little melty soy men, "Grubbie Babies" from Prescott Primitives, a cottage industry started by my sister that makes these little cuties along with a whole line of other rustic, primitive homey treats. "Grubbied up" with a blend of aromatic spices, rubbed into the soy, ready to melt in your tart warmer. Hey y'all! This is Margaret from Prescott Primitives and we are launching our Fall and Winter line! We specialize in primitive and country home goods that are hand crafted and made with the "best of class" materials. Our soy warming tarts, for example, are made from the highest quality soy wax and scented using perfume grade fragrance oils. All wrapped up in a crisp cello bag, tied with homespun and a little rusty collector charm! We think they're pretty special and we know you will, too. Anna here, and thank you Margaret for sharing these adorable tarts with us. I used "Prairie Praline" scented tarts today in my house, and the scent was incredible. Strong with a great scent throw. The smell was warm, cozy, inviting, homey, comfortable, you don't want to leave the room honestly. With a caramelized brown sugar, yummy buttery vanilla, and nutty candied pecans.